Starting from the Ethiopian highlands, the coffee bean has since spread worldwide. In doing so, many different cultures have found inspiration in the humble bean to develop their own unique beverages. From the addition of egg yolks in Vietnam to gelato in Italy to spicy peppercorns in Senegal, here are 16 ways to serve coffee around the world, complete with step-by-step recipes so you can host your own multi-cultural tasting party. What's Your Favorite Unique Coffee Drink? Though grown and savored worldwide today, coffee can trace its origins to the intuition of a single goat-herder on the Ethiopian plateau. The herder noticed his goats became particularly energetic after eating certain berries. He reported his observation to a local monastery and from these humble beginnings emerged the global industry we know today. By the 15th century coffee was being grown and traded commercially on the Arabian Peninsula. Europeans joined the caffeine train in the 17th century and coffee houses quickly became gathering places for artists and intellectuals. In 1723, a naval officer brought a coffee plant seedling on a perilous journey across the Atlantic Ocean to the Island of Martinique. The seedling thrived, fostering a booming coffee industry on the island, and served as the parent for the coffee trees throughout modern day South and Central America and the Caribbean. Through colonization, trade, and religious missions, coffee seeds have been transported around the world where many flourished and others perished. Today, coffee is the second most sought commodity in the world after crude oil. 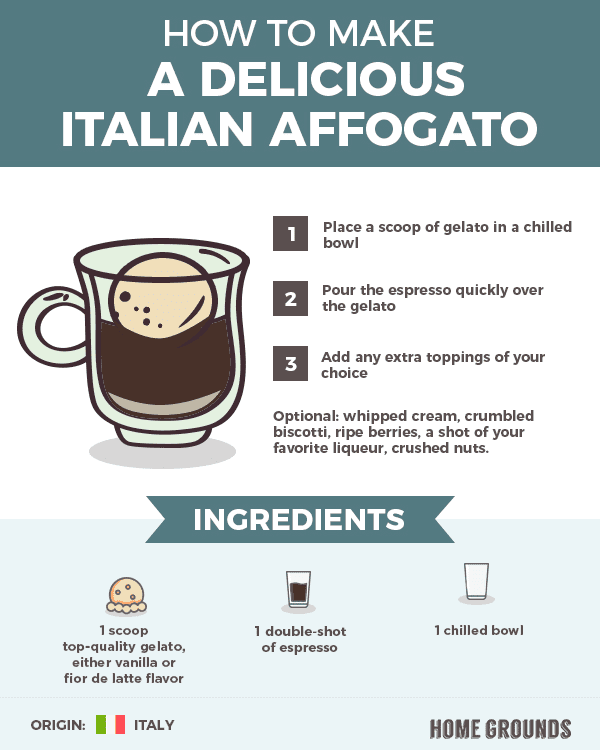 The Affogato is a classic Italian preparation pairing espresso and gelato. In Italian, “affogato” means drowned, a reference to the fact that the espresso is poured over a scoop of gelato, drowning it. The Affogato suffers from a bit of an identity crisis, not knowing whether it should be a dessert or a drink. Despite the confusion surrounding this drink, it is a global hit, with variations abound using brewed coffee, ice cream, liqueur, and all manner of creative toppings that render it fully in “dessert” territory. I bet you are now thinking about coffee based desserts (I know I am), and luckily for you we have a very complete article about them here. Optional extras: whipped cream, crumbled biscotti, ripe berries, a shot of your favorite liqueur, crushed nuts. *In a traditional Affogato, the simplicity is part of the appeal, but it also leaves no place for subpar ingredients to hide. Make sure to source the best gelato and espresso you can find. Place a scoop of gelato in the bowl. Using a chilled bowl will help ensure that the gelato doesn’t immediately melt upon addition of the espresso. Pour the espresso quickly over the gelato. Add any extra toppings to suit your fancy. Kaffeost might be a hard one wrap your head around. The name translates to “coffee cheese”, which is an apt description of the beverage. It involves hot coffee poured over cubed cheese. The cheese itself is a Finnish product called “Leipäjuusto” or bread cheese in Finland and Finnish squeaky cheese in America. In Finland, the bread cheese is served sliced as a side with coffee, but in Northern Sweden, they prefer it directly in the coffee. The cheese cubes soften and absorb the coffee, but they don’t melt. It may be possible to source your Finnish bread cheese from a specialty shop, but it is both fun and rewarding to make your own. Place the milk and cream in a large pot and warm them to 37 C (99 F). Remove the pot from the heat and stir in the rennet. Let the mixture sit for an hour while curds form, then reheat it to 37 C (99 F) while gently moving the small curds to the center of the pot. Then bring the whole mixture to just under a boil. Line the strainer with the cheesecloth, and place a vessel underneath to catch the water that strains through. Pour the curds into the cheesecloth, fold the cloth around them and push hard to extract as much water as you can. With the curds still wrapped in the strainer, put a heavy weight on top and let them sit and continue to drain for another few hours until you have solid cheese. Place the cheese in an oven-proof dish and bake at 177 C (350 F) until golden brown. To make kaffeost, simply slice your cheese into cubes and add them to a mug. Pour your favourite coffee on top and enjoy. The true delicacy is the coffee-soaked cheese cubes, not the cheese-infused coffee liquid. Turkish coffee is well-known around the globe though still rarely offered in Western coffee shops. It consists of a unique preparation method more than a recipe. The most important aspects of Turkish coffee are that the sugar is added before boiling, rather than to the finished cup, and the extremely finely ground beans are not strained out at the end of the process. The boiling process employed in Turkish coffee leaves a thick froth on the surface which is a hallmark of the style. Cream or milk are never added and the coffee is never stirred so as not to disturb the foam. *The traditional vessel for boiling Turkish coffee is called an “ibrik.” If you don’t have one, a small saucepan will work just fine. Bring water and sugar to a boil in the ibrik or saucepan. Remove from heat and add the coffee and cardamom. Return the ibrik to the heat and allow the mixture to come to a soft boil. Remove from the heat when the coffee foams. Repeat this process twice. Pour into 2 demitasse cups, and allow to sit for a few minutes while the grounds settle to the bottom of the cups. Austrians take coffee very seriously, particularly in the capital city of Vienna where coffee houses abound. In fact, the "Viennese Coffee House Culture" received a UNESCO designation as "Intangible Cultural Heritage" in 2011. The Einspänner is a single or double espresso topped with whipped cream. The name comes from the German word for a single-horse carriage which can be driven with only one hand, leaving the other free for coffee consumption. The whipped cream topping serves as an insulating layer so carriage drivers have extra time to enjoy their espresso before it cools. In a chilled bowl, whip the heavy cream with sugar and vanilla until stiff peaks form. Mix the espresso and sugar, if desired, together in a glass. Top with the whipped cream. Add chocolate shavings and/or cocoa powder if you wish. 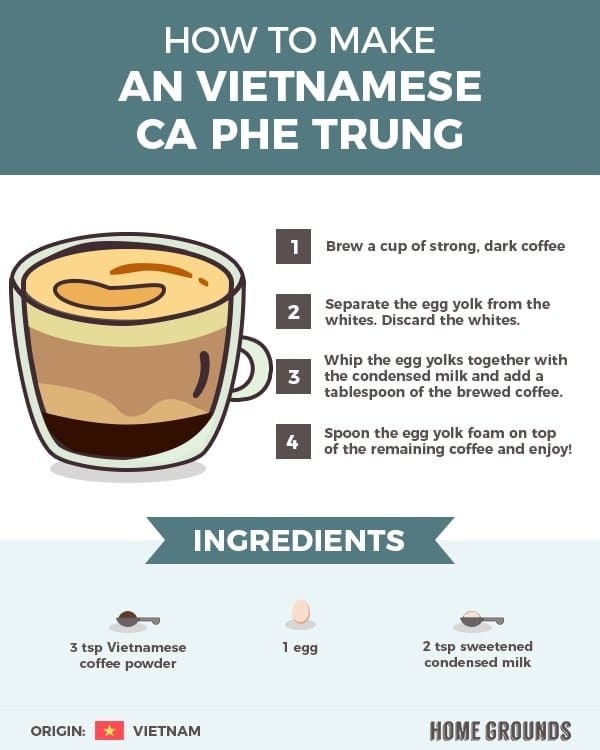 Ca phe trung is also known as Vietnamese egg coffee and, like kaffeost, it tastes much better than it sounds. It is typically made from egg yolks, sugar, condensed milk and robusta coffee. Some tasters have described it as essentially a “Cadbury Creme Egg with a hint of mocha”. Though the origins of the beverage are cloudy, many suggest it arose when dairy products were scarce in the country. Coffee drinkers desperate for a creamy cup of java were forced to get creative and use whipped egg yolks instead. Brew a cup of strong, dark coffee. Using a phin and Vietnamese robusta coffee adds authenticity. Separate the egg yolk from the whites. Discard the whites or save them for another purpose. Whip the egg yolks together with the condensed milk until a frothy mixture is formed. Continue mixing while adding a tablespoon of the brewed coffee. Spoon the egg yolk foam on top of the remaining coffee and enjoy! And don't throw the eggshells! Check why you should put them in your coffee here. Scandinavian egg coffee is a brewing method developed in Sweden and Norway and brought to parts of the American Midwest. Coffee grounds are mixed with raw egg before being added to boiling water. The theory is that the egg whites break down in boiling water and release proteins that bind to any bitter impurities in the coffee. The resulting coffee is a beautiful golden-amber color with a clean, silky body and super mellow flavor. The strategy was borne of necessity, at a time when good coffee was not readily available, so it is less common these days. Break the egg into a cup and add the coffee grounds and 2 Tbs of the ice water. You can also add the shells, if you wish. Mix it thoroughly. Bring the cup of water to a boil and add the coffee grounds mixture. Boil for 5 minutes. Remove from the heat and add the remainder of the ice water. This will cause the solids to sink to the bottom. Serve the liquid coffee from the top of the pot. If there are clumps floating around, you can strain it before serving. Cafezinho translates to “little coffee” and is synonymous with hospitality in Brazil. Being offered a cafezinho is like an invitation to sit down and relax, let your worries slip away, and enjoy some conversation and good company. Compared with a regular drip coffee, cafezinho is extremely thick and strong. It is even more concentrated than espresso and is served super sweet without any milk or cream. Its unique characteristics come from the use of a special cloth flannel filter for brewing. Put the water and sugar in the saucepan and heat to just below boiling. Add the coffee grounds, remove from the heat and stir well. Pour the solution into the filter over a cafezinho or espresso cup and wait for it to drip through. Don’t try and force it through by squeezing the filter and your patience will be rewarded. Qahwa is simply the arabic word for “coffee”, but it is served in a unique fashion in Saudi Arabia. Though the brewing method is similar to Turkish coffee, they use green coffee beans and make a very weak brew. Along with cardamom, a few other seasonings are regularly added including saffron, rose water, cinnamon and cloves. Traditionally, the coffee is served by the youngest person at the gathering and it is considered a sign of respect to be served first. It is almost always served with dates or another sweet. Bring the water to a boil in the saucepan and add the ground beans. Let it boil for 10 minutes. Add the crushed cardamom and cloves and boil for another 5 minutes. Take the pot off the heat and wait for a few minutes while the grounds settle to the bottom of the pot. Add the rosewater and saffron, if desired. Strain or filter the coffee into a flask or teapot for serving. Cafe de Olla translates as “Pot Coffee” a name which comes from the fact that it is brewed in a clay pot. It is a comforting beverage most often found in rural areas with cold climates. The distinct flavor of the drink comes from cinnamon and piloncillo, a traditional Mexican sugar. Other potential additives include clove, allspice, black peppercorns, and orange peel. Rarely is it served with any milk or cream. *You should try and seek out true Mexican piloncillo, but dark brown sugar can be substituted. Put the water in the saucepan and add the piloncillo cones, cinnamon, and any of the optional ingredients that appeal to your tastebuds. Bring the water to a boil, let the sugar dissolve, then remove it from the heat and add the coffee grounds. Let the grounds steep for 8 - 10 minutes. Ladle the liquid into cups and serve. Pharisäer kaffee is a German coffee infused with rum and topped with whipped cream. The story goes that it was invented because of a local pastor that was very strict when it came to alcohol. Parishioners spiked their coffee with rum and topped it with whipped cream to keep the rum aroma from wafting through the air to the pastor. You aren’t supposed to stir Pharisäer coffee, but rather sip it through the whipped cream. Pour the coffee into a tall cup, traditionally a glass tumbler. Stir in the sugar and rum. Beat the whipping cream by hand or with an electric mixer until stiff peaks form. Top the drink with whipped cream and be sure not to stir it further. Yuanyang is a popular drink in Hong Kong made from a mixture of coffee and Hong Kong-style milk tea. The name refers to mandarin ducks which appear in pairs and the male and female ducks are very different in appearance. In the same way, coffee and tea are very different, but their combination is lovely. The most popular teas to use are the highly caffeinated Assam and Ceylon which, when paired with coffee, make for a drink with a serious jolt. To make the milk tea, put the water and tea leaves in the saucepan and bring to a gentle boil. Lower the heat and simmer for three minutes. Remove from the heat, add the sweetened condensed milk, and return to the heat to simmer for an additional three minutes. Combine one cup of the milk tea with the cup of coffee and mix thoroughly. You can experiment with the tea to coffee ratio if you wish. The yuanyang can be served hot right away, or chilled and then poured over ice for a refreshing alternative. Café Touba is a Senegalese drink flavored with grains of selim (also known as Guinea pepper). Unlike many other spiced coffees on this list, in Cafe Touba, the dried spices are ground together with the coffee into a powder which is then prepared as regular drip coffee. It is considered an elixir as the peppers are though to fight depression, have anti-allergenic properties and aid digestion. Cafe Touba is named for the holy city of Touba, Senegal and its consumption is increasing, both in Senegal and neighboring countries. It is now so popular that Nestlé launched a similar competing product called Nescafé Ginger & Spice. *Try to find real selim pepper if you want to make Cafe Touba. It is available from many specialty grocers or online. Heat the saucepan over medium and add the pepper grains. Toss them in the hot pan for a few minutes until they are roasted, but not burnt. They will release a peppery aroma that might make you sneeze. Place the roasted selim grains along with the coffee beans into a grinder and grind to a coarse texture. Put the grounds and the cold water into the saucepan and bring to a boil. Let simmer for 5 mins. Pour the mixture into the pour over coffee maker. Lagrima is the Spanish word for tear and it is descriptive of this mild drink. It features an espresso cup filled with warm milk and only a small ‘teardrops’ worth of coffee. Argentina, and the capital Buenos Aires in particular, has a thriving coffee culture though the coffee itself is rarely top notch. Most often, beans are low quality Brazilian imports that have been “sugar roasted”, a technique in which green beans are roasted together with sugar. This may explain the popularity of a beverage with such a low quantity of actual coffee. Warm the milk in the saucepan. Pour the milk into a mug and add the espresso. Bulletproof coffee is a strange combination that has seen remarkable success in recent years. Marketed as a meal replacement, an energy drink, and brain booster, it is made up of coffee, butter, and patented “Brain Octane Oil”. Bulletproof coffee was founded in 2013 by Dave Asprey, advocator of the high-fat Asprey diet. Though few of Asprey’s claims are backed by hard science, his coffee recipe is incredibly popular and the company recently announced it had raised another $19 million in funding. Naturally, Asprey’s official recipe for Bulletproof coffee suggests purchasing his proprietary products, but unbranded alternatives will work just as well. Mix all the ingredients in the blender and blend for about 30 seconds until you have a creamy, foamy drink. Try starting with 1 tsp MCT oil the first time you try Bulletproof coffee and gradually increasing the amount as you become more experienced with the drink. The origin of the Flat White is hotly contested between Australia and New Zealand, but its earliest documented appearance was in Sydney in 1985. Since that time, the beverage has gained global popularity, with even Starbucks now offering a version. Sometimes known as a wet cappuccino, the Flat White consists of a double shot of espresso topped with steamed milk microfoam. Many people incorrectly refer to it as a small latte, but in fact the milk to coffee ratio differs between the two beverages. The Flat White has less steamed milk resulting in a greater coffee flavor. *You should only attempt this drink at home if you have access to a quality espresso machine with a steam wand and the skills to use it. Preheat a 6 oz. mug with hot water. This step is important for low volume drinks like this one, otherwise the espresso will cool too quickly. Pull a double shot of espresso into the warm mug. Pour the milk into the steaming pitcher and froth it with the steam wand. As it froths, use the spoon to fold the microbubbles from the top of the steaming pitcher to the bottom. This creates the characteristic velvety texture of the Flat White. Pour the steamed milk directly into the centre of the espresso. Latte art optional. Learn more about Australian Coffee here. An Espresso Romano is achieved by sliding a lemon slice around the edge of the cup and serving it with a peel of lemon zest on the side. The combination of lemon and espresso is not unusual as the sourness of the lemon is thought to enhance the sweetness of the espresso. Some suggest this drink emerged during World War II when water was scarce and the lemon juice was used for sanitation in place of washing. Other sources indicate that Italians have long regarded the combination of lemon and espresso as a remedy for headaches. Pull a single or double shot of espresso into a pre-warmed espresso cup. Rub the lemon slice around the lip of the glass. Be careful not to mix the lemon with the espresso at any point because the lemon juice will cause the crema to dissipate. Serve with the strip of lemon peel on the side. Kopi Joss has become very well known around the world and quite a tourist thing to do in Indonesia (even though watching a lump of burning coal drop into a coffee looks like the drink of the devil). The story goes that Kopi Joss was invented in the 1960s in the Indonesian city of Yogyakara by a coffee stall vendor called Mr. Man (seriously, Mr. Man. Mr. Man the coffee man…). Apparently he had a tummy ache and as he made himself a cup of coffee, he spotted the burning coal he used to boil the water and the idea hit him. The coal would make it better. (Not sure how he knew that, but he did). He took a piece of the hot coal and dropped it into his coffee. And he felt better. Since it worked, entrepreneur that he was, he started selling it. And you can still buy it at the same drink stall today. According to many, it helps alleviate bloating, nausea, heartburn and diarrhea. *The original is coffee with the grinds running around in the cup loose – if you want to be fully authentic. Heat your coal. It has to be REALLY hot. Hell hot. Make your coffee – since this was invented in Indonesia, that’s a good choice for your bean, but any coffee will do. Fill your cup 2/3 full with coffee- – you need room to drop the coal into the cup and let it froth up. Remove the piece of coal and drink! There’s a reason that Irish eyes are smiling and we’re pretty sure that reason is Irish Coffee. And it’s not just about dumping some whiskey into a coffee, it’s more delicate and nuanced than that. Done right, it’s like the Irish angels have come for a wee visit. It is spectacular. Combining cold brew coffee and lemonade might sound weird, but it is, in fact, it is delicious. Especially if you are sitting in just about any Portuguese seaside town feeling the ocean breeze on your skin and the sun on your face, delicious mazagran in hand. Legend has that in the 1840s French soldiers invented this drink while stationed at the Mazagran fortress in Algiers, Algeria. The coffee helped them stay awake (we hear that!) and along with the lemonade, they would often add rum (such a great idea). If this list teaches us anything, it is that coffee is a remarkably versatile drink. It has been adopted by cultures around the world and made into unique beverages that are truly representative of individual regions. While not every recipe herein will appeal to every palate, each gives a fascinating look at a particular community at a certain point in history. So try one today, or host a global tasting party and try all 16 coffees from around the world. Let us know what you tried and how it turned out in the comments. Have you ever experienced a unique coffee beverage on your travels? More weird and different drinks here.